I came up with this simple recipe as an alternative to alcohol when accompanying barbecues. Warm weather brings with it a lot of outdoor activities where beer and wine are always up in line. We already started having weekly barbecues or gatherings and having this drink as an alternative was greatly welcomed. It was also a nice thought for the small members of the family. Adding more berries will promise a richer taste although it is not needed. If you are not keen on trying this recipe then you might want to add a little bit more berries. 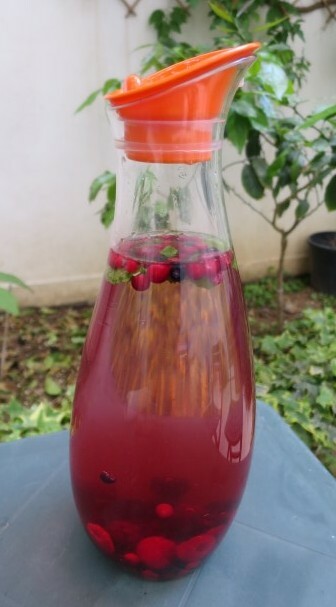 With time, the water turns into a diluted berry juice, and we greatly enjoyed the taste of it. At the end do not forget to eat the berries, my nephew was eagerly bulging on the water to get to the berries.